From the producers of Death Note, one of my fave Japanese movies in some time comes the title Gantz, an odd tale about death and those whole deal it out. Gantz is an enigma, not the movie but the black sphere that pulls people from near death experiences and kits them out to kill on its behalf. I must admit that in the first twenty or so minutes of this title I was ready to consign it to hell on this review and if I had just lost interest and started typing it would have received a five or six out of ten based on that viewing. Having said that, Gantz pulls you in despite the hokey first encounter fight scenes that nearly lost me. 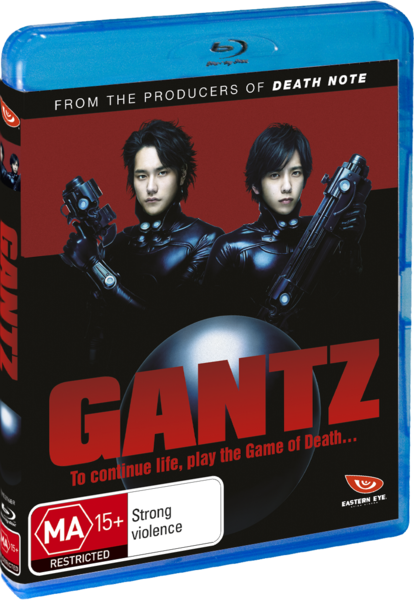 Set up like a bizarre video game, Gantz sends its “contestants” into a real world arena, equipped with super suits and hi tech weaponry to fight and kill aliens that it displays to the people that it captures. They then have to get the job done within a specific timeframe and get points for doing so. Once you get 100 points, you can be free, or revive someone who has been killed in the game. Between rounds you are returned to your normal life, albeit equipped with the suits from the game. Whilst on blu-ray, the quality of the title does have a fair bit of grain, not that it took anything away from the movie. Effects are pretty basic in my opinion, however suit the narrative and are not too hokey to take away from the story. Audio is well presented and language options are Japanese with English subtitles. Gantz has a unique subtitle structure that I was pleased to see carried over into English that really showed the alien nature of the sphere.